Ministry of Propaganda - 11/Feb/2006: "Saturday Walk"
With the weather forecast for tomorrow showing clouds and drizzle while today was still quite reasonable I decided to pull in my Sunday walk to today, Saturday. 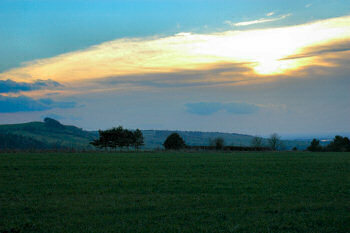 The walk started in Heddington near Calne, just over 30min drive from Swindon. Arriving in Heddington I passed the Ivy Inn, which looks like a nice pub to visit in the summer. I parked my car near the church, changed into my walking boots and set off west up the hill. After passing Hill Cottage the walk followed the Wessex Ridgeway through the Roundway Downs. At first glance the area looks quite unremarkable, large fields crossed with a number of tracks. But there's more than meets the eye: In 1643 a bloody Civil War took place here during which Sir William Waller was defeated by Royalist forces. According to the walk description from the January 2005 edition of Country Walking there should be an observation platform somewhere, either I missed it or it's now gone. 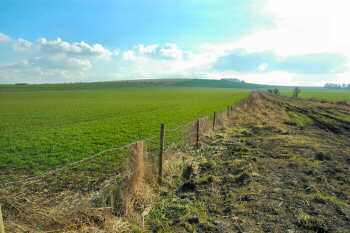 My next stop was when I arrived at the Wansdyke near the A361. 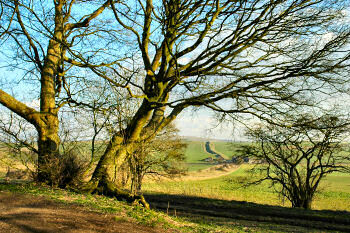 Under some trees and overlooking the Wansdyke stretching west into the distance I had a late lunch. Refreshed I continued east, walking along the embankment of the Wansdyke. During my walk two weeks ago I had only taken a short look at it, this time I walked on and along it for almost two miles. The last part of the walk was through Hampsley Hollow and turned out to be the most exhausting: The bridleway I followed was churned up quite badly and the mud stuck to my boots in large chunks and layers. At times it felt like my boots weighed at least 5 kilos and my walking pole had a ball of mud more than twice the weight of the pole sticking to its tip. 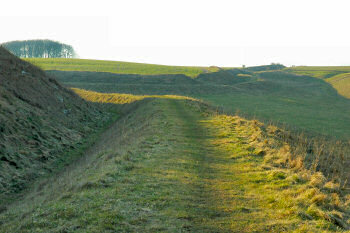 I was quite relieved when I reached the lane leading back to Heddington. After almost exactly three hours (and 6 miles of walking) I arrived back at my car. Clouds had started to move in, it looked like I had made the right decision to go for the walk today. I briefly thought about stopping at the Ivy Inn for a pint, but then decided to leave this for another visit during the summer and drove home.